Recent data trends suggest the U.S. economy is growing at an annualized pace of just less than 1%, according to Markit's chief economist. Growth trends are moving downward. In the second quarter of 2016, global economic growth failed to improve its sluggish pace, a sign that the world “remains mired in the worst growth phase for three-and-a-half years,” according to Chris Williamson, chief economist at Markit, a financial data service. “Once again, the lack of any growth driver was evident: weak rates of expansion in the U.S. and U.K., linked in part to rising political uncertainty, a struggling recovery in the eurozone and renewed downturn in Japan coincided with an ongoing near-stagnation of the emerging markets,” Williamson explained in a report early Tuesday. But the news is even worse for the U.S. In the U.S., growth remains “disappointingly weak” compared to what was seen in early 2016. Plus, Markit’s flash PMIs suggest the U.S. economy is growing at an annualized pace of just less than 1%, as measured in the second quarter. “This represents the weakest extended period of growth seen in the U.S. since the 2009 financial crisis, with businesses struggling amid weak global demand, the energy sector downturn, the strong dollar and uncertainty caused by the upcoming presidential elections,” Williamson said. The JPMorgan Global PMI, the Purchasing Managers’ Index compiled by Markit from its worldwide business surveys, held steady at 51.1 in June, but that marks its weakest quarter since the fourth quarter of 2012. “The data point to global GDP (at market prices) rising at an annual rate of just 1.5%, below the long run average of 2.3% and signaling the weakest growth spell since the first half of 2013,” Williamson stated. In the developed economies, growth as measured by the PMI fell to 51.5 in June from 51.6 in May, hitting its second-lowest level over the three years, “maintaining sluggish growth that has been evident since the down-shifting of gear back in February,” he says. “The malaise was broad-based, with both manufacturing and services recording only modest growth rates in June. Services remained the stronger-growing sector, albeit by only a small margin, with the pace of expansion much reduced compared to that seen at the start of the year,” according to the economist. Of the four largest developed world economies, the eurozone kept its top spot in the PMI growth rankings by a slim margin thanks to faster manufacturing growth. “Producers continued to benefit from the weak euro as well as sluggish but ongoing improvements in domestic demand, the latter also helping drive further service sector growth,” the economist explained. The surveys, however, are signaling GDP growth of just 0.3%, he adds. The UK also continued to expand, but much of the June data was collected prior to the country’s referendum vote to leave the EU. “Uncertainty regarding the referendum had already been a major factor bringing the PMIs down to a level that signals just 0.2% GDP growth in the second quarter, and the intensification of uncertainty after the vote, including the political upheaval, suggests there is a strong risk of the economy deteriorating in coming months,” Williamson stated. Japan remained the worst-performing of the major developed economies, he says, with the Nikkei PMI surveys indicating that this economy experienced one of the worst periods of growth seen over the past four years: “The surveys point to a strong risk that the economy has slipped back into contraction in the second quarter as manufacturing has been hamstrung by the appreciation of the yen and services growth has failed to gain momentum.” In the developing economies, the best news is coming out of Russia, where the PMIs are signaling the fastest rate of economic growth since February 2013 due to expansion in both manufacturing and services. “The improvement in the survey data suggests that Russia is pulling out of the energy-related slowdown and questions widespread expectations of ongoing recession,” according to the economist. In Brazil, where the PMIs are signaling an easing in the rate of decline to the slowest level since January, the country remains the worst performing of the four BRIC economies (Brazil, Russia, India and China). “The Nikkei PMIs for India picked up signs of faster growth in manufacturing, but also suffered a slowdown in service sector growth, leaving the overall pace of economic expansion stubbornly subdued,” Williamson said. In China, the Caixin PMI points to “overall ongoing malaise.” The bright spot is services, which reported its strongest upturn for 11 months, he says, though that was offset by the steepest fall in manufacturing output since February. “While the divergence in the two sectors points to a rebalancing of the economy toward services, the headline rate of growth eased to the weakest in four months and [signals] a near-stagnation of overall business activity,” Williamson said. 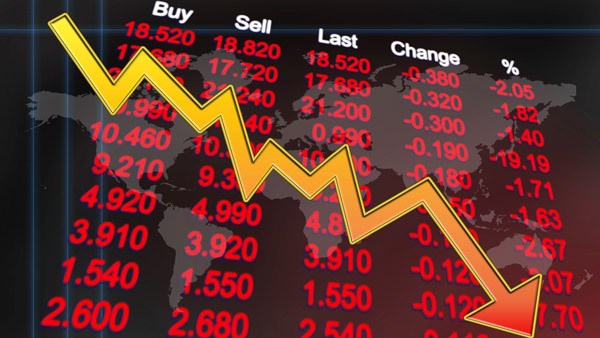 — Check out Treasury Yields Fall to Record Low; Further Declines Expected on ThinkAdvisor.